“Paruppu Obbattu” or simply “Obbattu” (Paruppu in Tamil / Bele in kannada means lentil) also known as Holige, Bobbattu, Pozhi (read PoLi) in different South Indian languages is one of my favorite traditional sweets. Obbattu marks its presence in many auspicious functions, especially Iyengar weddings. Growing up in Mysore, Obbattu was synonymous with ‘Dasara‘ festival more fondly ‘Bombe Habba’ for us. Celebrations would begin on the first day typically with setting up of the traditional tiered platform for arranging the dolls. Marked side by side are the memories of the faint aroma of elakki (cardamom or elaichi), ghee and boiling jaggery from the kitchen in my grand dad’s house in preparation of Obbattu. The little cook in me was always happy being the ever ready assistant to my aunts, enthusiastically participating in the Obbattu making process. As a middle schooler, I could walk away from the kitchen head held high with pride if I got my wrapping, filling and patting right without any tears. In Iyengar lingo, Obbattu is mainly made of two parts, the dough for outer wrapping or “Kanika” and the sweet filling on the inside or “Poorna”. If you want Obbattu to be soft on the outside, you can use half and half of Maida (Refined Flour or All purpose Flour) and Chiroti Rava else if you want it crisp on the outside, just chiroti rava is what you need for the “Kanika” dough. Chiroti Rava is a very fine form of Sooji Rava almost close to flour consistency. Turmeric is a must add while preparing for all auspicious occasions, we were taught and you will see why when you read on. 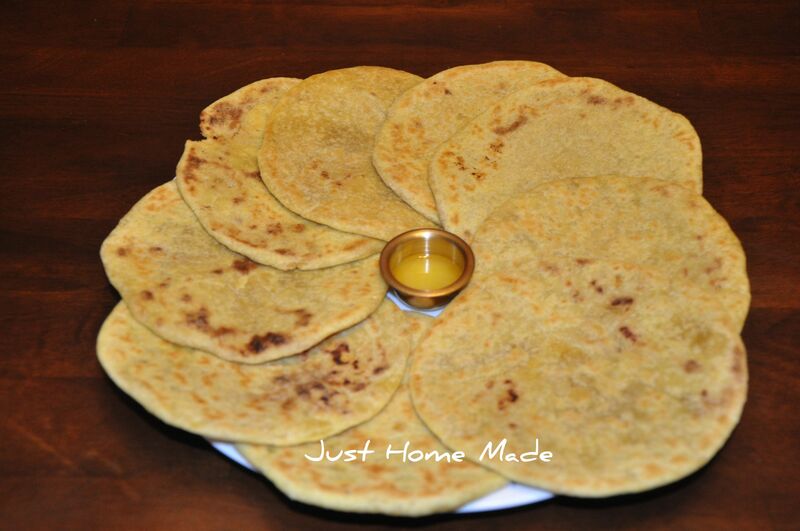 Before we start, remember, Obbattu making requires patience, it is not an item to be made in a hurry. Wash the chana dal and tuvar dal mixture well and pressure cook with a pinch of turmeric and just enough water to cover the dal. The secret to making perfect poorna lies in a perfectly pressure cooked dal with the littlest water. While the dal pressure cooks, mix together the chiroti rava, a pinch of turmeric and a little salt. Add in the ghee and mix together making sure that when you hold the mix tight in your palm it retains its shape without falling apart. Now sprinkling a little water at a time, mix it into a firm but not hard dough (not as soft as chapathi dough). 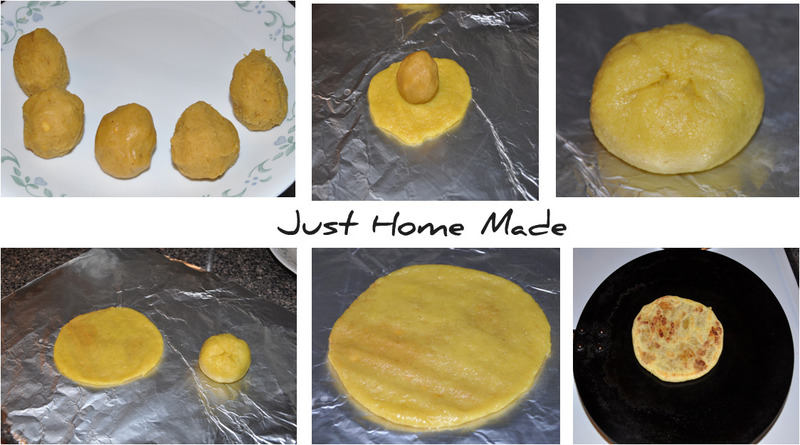 Pour in half the oil on the dough, cover and set aside at least for half an hour to an hour. Once the cooker cools down, drain the dal of remaining water if any and pulse in a mixer with elaichi. When the dal is half ground, add in the jaggery and pulse for a smooth paste. Cover the filling and set aside for half an hour. Knead the Kanika well till all the oil is absorbed in. Add in the remaining oil and repeat until Kanika is soft and pliable and stretches well. Take 1/2 the amount of kanika compared to Poorna, pat on an oiled aluminum foil (can use plantain leaf wherever available) and stretch on all sides. Place the poorna on the stretched kanika and cover from all the sides. Now pat this flat as thin as possible with your four fingers. Make sure not to add too much water while mixing the dough. If the filling is not hard enough to be shaped into a ball, add in 1 – 2 tsp rice flour and mix in, this should do the trick. Alternatively, 1/3 cup each of chana dal, tuvar dal and coconut can be used to make the Poorna. Grind the coconut first, add in the dals and pulse and finally blend in the jaggery. awesome recipe, if you add Poppy seed (gasgase) to filling it tastes heavenly !!! thank you for posting this recipe. you guys are so creative and i’m glad to see people show what they do best??????????????????????????????????????????????????????????????????????????????????????????????? ?